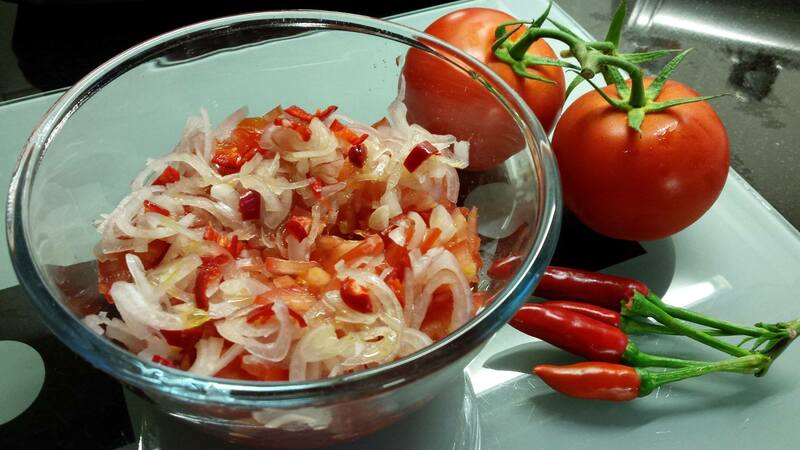 I don’t think that “Chatini”Pomme d’Amour (Tomato Salad or Salsa) needs an introduction, it has for long been a popular accompaniment of Mauritian cuisine. It accompanies almost all Mauritian dishes. Some people like it mild, others like it chilli hot with lots of fresh herbs. As many of you know Mauritian Cuisine is very much a fusion of flavours of different continents, and so is our “Chatini”. Typically, the original Indian Chatni is made from a mix of uncooked fruit (such as mangoes, apples, bananas etc), green chillies, green herbs and spices, vinegar and sometimes sugar ground together to make a paste. Indian and Mauritian Chatni are fresh and intended to be consumed soon after they are made. I like to add finely chopped lime or lemon to my Tomato Chatini, which is something I learnt from my grandfather. It brings back memories of my childhood. When were and whenever we visited my grandfather he would quickly rustle up chutney as an accompaniment dish. He added fresh tangy lime or lemon to the chutney which gave it a very fresh taste while reducing the hot chilli taste in the chutney. The aroma was enough to make one hungry. We are so privileged to be able to get all these raw fresh ingredients in almost every food stores/markets. Juicy bright red sweet tomatoes alongside fresh herbs put together not only have great flavour, they taste fresh. I can’t think of a better way to celebrate these delicious raw ingredients together. This is what I call summer on the plate and palate. 1. Finely chop the tomato flesh and place in a serving bowl. 2. Finely chop the chilli and rest of the other ingredients. 3. Mix all together. Sprinkle with the olive oil. 4. Season to taste. Sprinkle the chopped fresh coriander or basil. Serve the tomato chutney at room temperature to accompany curry and rice dishes, Biryani or many more.